Celebrate the 49th anniversary of the 'three days of peace & music' celebration, Woodstock, where 32 acts performed to an audience of 400,000. Back by popular demand, The Reals and Marion Loudon will present Woodstock at the Rhumbelow Theatre at Tina’s Hotel in Kloof from August 29 to September 9, 2018. Woodstock took place from August 15 to 18, 1969, on Max Yasgur's 600-acre dairy farm in the New York town of Bethel. Creedence Clearwater Revival were the first act to sign a contract and this persuaded other big acts to follow suit. The Rolling Stone magazine listed Woodstock as one of the “50 Moments That Changed the History of Rock and Roll”. 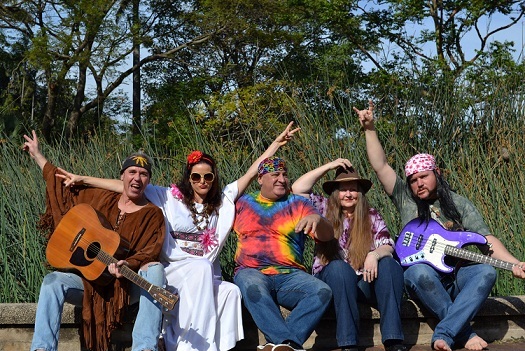 Celebrate the music of Woodstock with The Reals, featuring the talents of Barry Thomson (guitar/vocals), Dawn Selby (keyboards/vocals), Mali Sewell (drums/vocals), Jason Andrew (bass guitar/vocals). The vivacious and super talented Marion Loudon (vocals/percussion) will join The Reals for this production. Watch audio visual excerpts from Woodstock. Dress up in 'Woodstock' style and stand a chance of winning the Best Dressed prize.